Yes, I want the catalogue! With Your Videoscribe you have at your disposal an innovative video production service, very famous in the United States: the animated video presentation. An animated video presentation is a dynamic and interactive way to present your product with the use of movement, text, video, music and images. Thanks to its simplicity, it is easier for the majority of the public to learn. Unlike posters and brochures, animated videos are not static - they engage viewers with their whimsical appeal, their dynamism, their ability to simplify concepts. 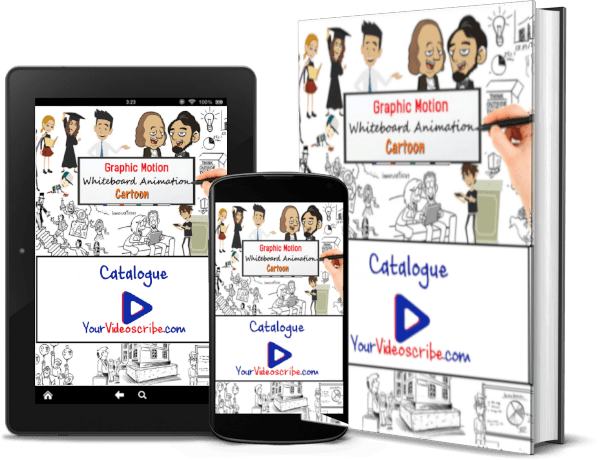 Thanks to our professional video production you can create a whiteboard animation to offer quality to your customers and make your products or services known with a simple and attractive animated video. It is statistically proven that video animations are more effective in attracting attention than other forms of video or written communication. We are experts in video animation of the technique of whiteboard video, but we can also provide other products such as classic cartoon animation.